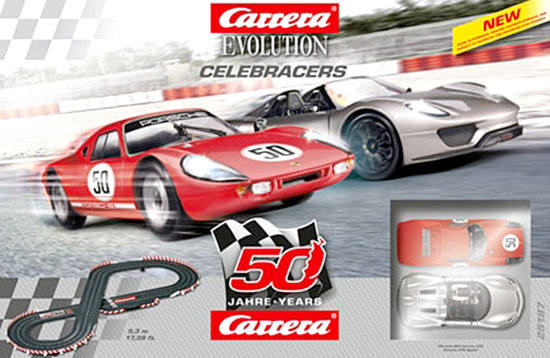 These are the 12 most popular Carrera analog race sets and we have put them on sale at a massive 1/3 discount for a limited time. No Dealers. 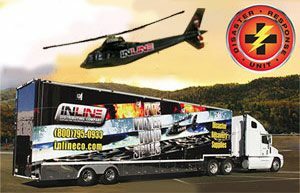 Complete 1/32 scale analog race set-everything you need to begin racing is in the box. 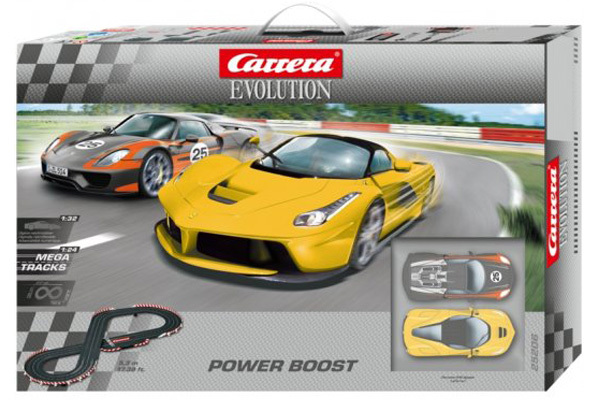 Carrera 25206 Power Boost set with LaFerrari and Porsche 918 Spyder. Two sports cars in a class of their own fight out superlative duels. There’s no other way to describe this clash of two automobiles very few people are ever likely to experience live. 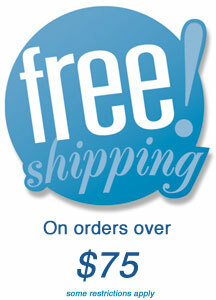 Take a deep breath – and put your foot to the floor! This 5.3-meter racetrack offers a long straight and bends that must be mastered with an acute feel for the power available. 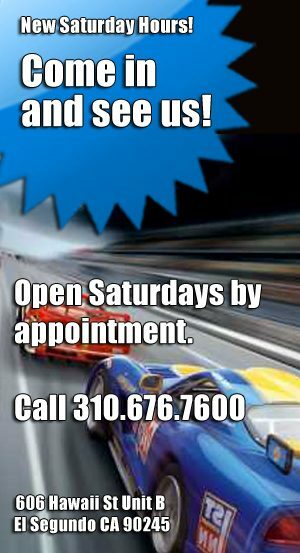 For lap after lap of pure uninterrupted action and racing enjoyment! Finesse is essential when driving the LaFerrari, the very latest car with hybrid engine technology from the Maranello stable. This 963 bhp two-seater is the most powerful Ferrari on the team. The Porsche 918 Spyder is a worthy match. It is also equipped with hybrid technology and can generate an inconceivable 887 bhp. The ’25’ on the bodywork stands for the car’s prototype number: no.25! Ready for high speed, high performance hybrid action? Nerves of steel are a ‘must’ for everyone involved! 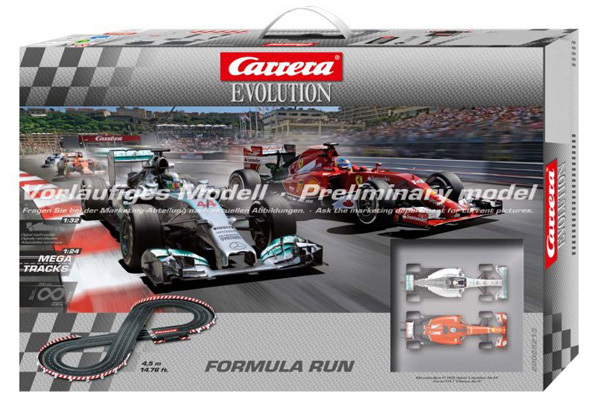 Carrera 25213 Formula Run set 1/32 scale analog. Mercedes won the 2014 constructors’ championship with the best car in Formula 1 before the end of the season. Right up until the final race of 2014 Nico Rosberg and his teammate Lewis Hamilton were locked in a neck-and-neck race for victory. Ultimately it was the ambition and skill of Lewis Hamilton that decided the grand prix in Abu Dhabi and the championship. Lewis Hamilton is now the proud owner of the title World Champion 2014. In the opinion of the experts his opponent, Fernando Alonso in his Ferrari, is the the most consistantly successful driver of the past 10 years. The Ferrari F14 T with an extremely flat vacuum cleaner snout is an incredible powerhouse and a big threat to Mercedes. 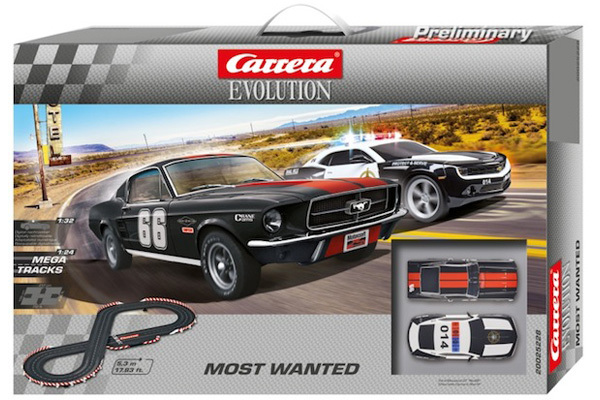 The 14,8-foot Carrera racetrack features two long straights and is perfect for close races between teams that have been so successful in Formula 1 racing in the past few years. This promises to be a spectacular head-to-head between the 2014 world champion Lewis Hamilton in his Mercedes and his opponent Fernando Alonso in an F1 car from Ferrari, one of the defining names in grand prix sport! And the winner? 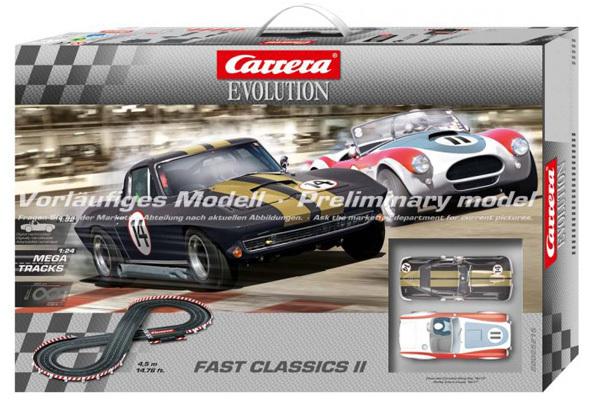 Carrera 25215 Fast Classics II set 1/32 scale analog. 6.56 x 2.62-feet, 14.8-foot lap length. Two traditional rivals are lined up for this summit meeting. The Shelby AC Cobra took to the tracks achieving a breath-taking 240 km/h, and in 1965 it was ready to make Gran Turismo history. The attempt to break European dominance in the GT class with this Anglo-American sports car was a complete success. The specs of the opponent, the Corvette Sting Ray Coupé, are no less impressive. The growl of the V8 cylinder engine still has jaws dropping in crowds around the world. 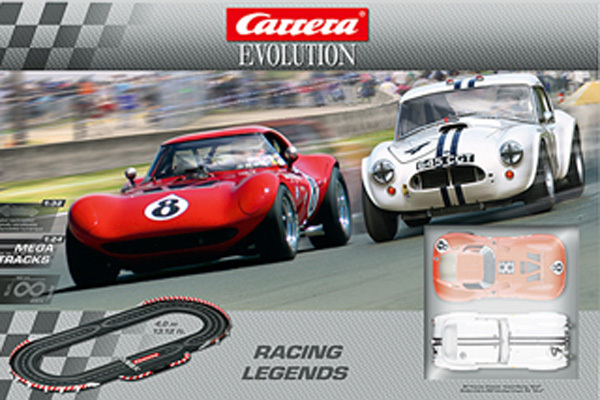 In 1967 at Le Mans the Corvette set a new speed record at 276 km/h. The originals would be almost priceless, but when they meet in the figure 8 on the 14.8-foot Carrera race circuit it’s the joy of driving that is priceless. Ford vs. Chevy. This race offers the ultimate adrenaline kick. The latest version of the iconic Ford GT Race Car is fitted with a 3.5-liter, twin-turbo, V6 engine and a giant diffusor. 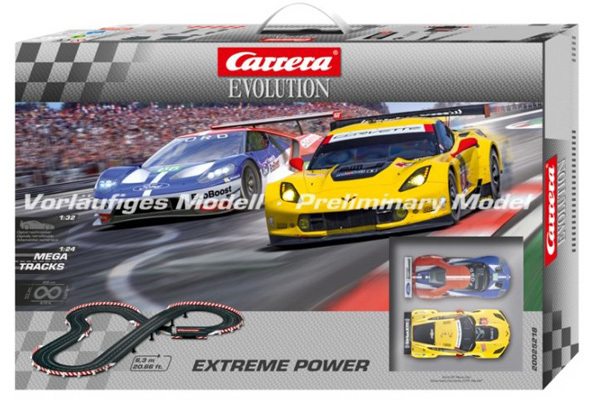 Across the grid there’s the immensely powerful Chevrolet Corvette C7.R with a 5.5-liter, V8 engine. Both of them offer aerodynamics and power incarnate. The challenge is to keep this power under control with icy nerves and precision around the 20.7-foot circuit from the “Extreme Power” Carrera analog set. The numerous bends demand absolute concentration and drifting skills. A Spanish final These two Spanish DTM drivers, Miguel Molina in the Audi A5 DTM and Daniel Juncadella in the AMG Mercedes C-Coupe DTM, are raring to go! 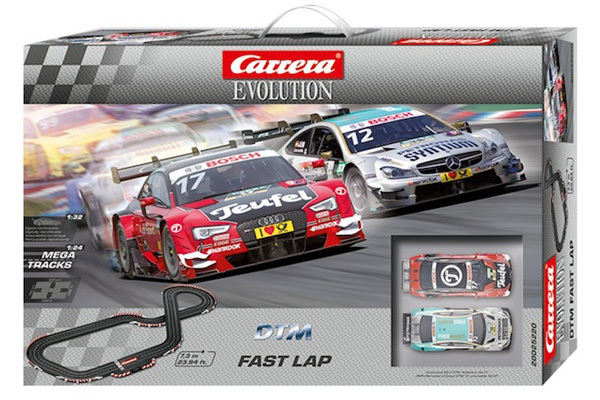 Both high-power cars will be battling for victory around the 7.3-metre circuit in the Carrera EVOLUTION “DTM Fast Lap” set. The rivals can draw level down the straight, and the best drifts in the subsequent chicane will make all the difference. Who knows which of these DTM toreros will cross the line first? In this race there are almost no limits. 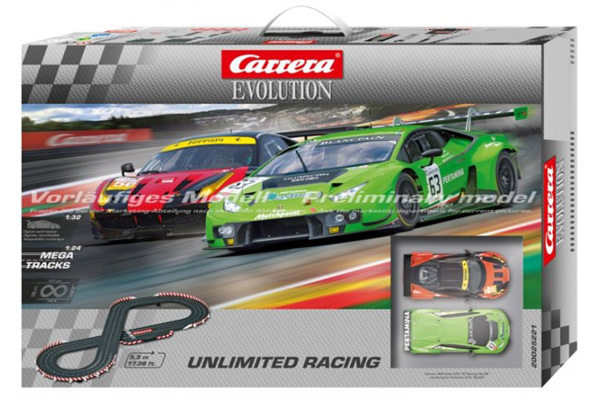 No wonder with a Carrera EVOLUTION “Unlimited Racing” set that features the mean, green 500 hp Lamborghini Huracán GT3 sportscar, and the awe-inspiring Ferrari 458 Italia GT2. This race is all about driving skill, because on this 17.4 ft. curcuit with a double bend anything can happen! 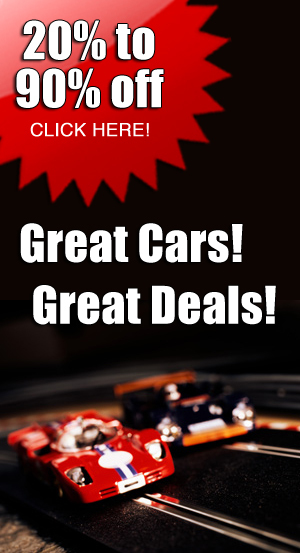 The only way to win is at top speed, yet with skilled drifts around the bends. The rival stars on this racetrack are both Italians! 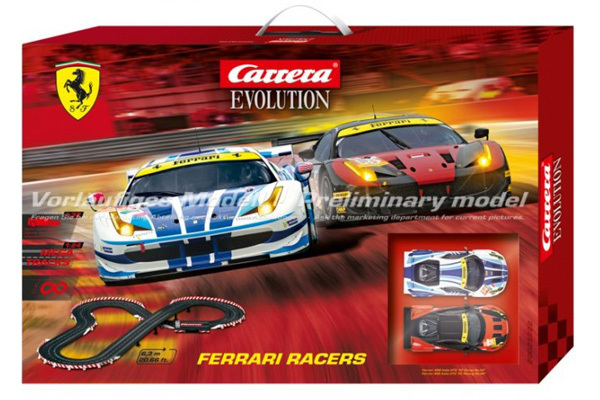 Carrera’s “Ferrari Racers” EVOLUTION set features two Ferrari 458 Italia GT2s. The cars, in the AF Corse and AT Racing designs, fight uncompromising battles along every centimetre of the 6.3-metre circuit! Spectacular drifts with the pedal to the metal are the only way to come out on top. A must for all fans of the Italian Ferrari car makers. 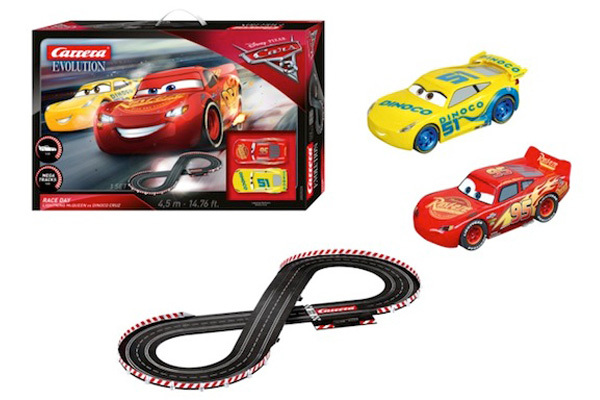 Lightning McQueen, the star of Disney/Pixar Cars, is ready for a new race. The 4.5-metre/14.76 ft. Carrera race circuit provides plenty of room for all action overtaking manoeuvres and high speed acceleration. Once again, Lightning McQueen has to prove himself against new opponents out on the track and be daring and skilful in new race situations! 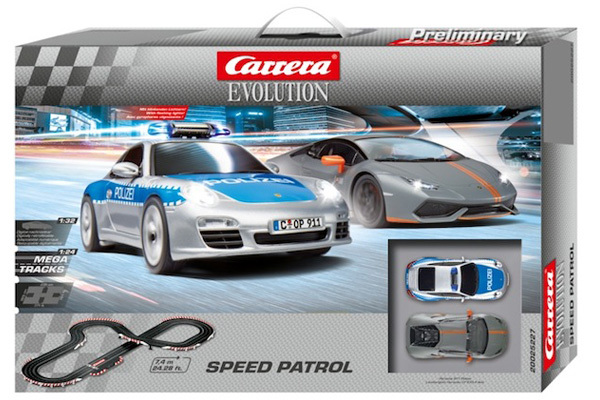 This race pits the Porsche 911 Polizei against the Lamborghini Huracan LP 610-4. The two opponents indulge in a red hot car chase around the curvy 7.4-metre/24.28 ft. circuit. The awe-inspiring V10 Lamborghini Huracan LP 610-4 engine produces 601.65 hp and can shoot from 0 to 100 km/h / 62.13mph in just 3.2 seconds. The Porsche 911 in its detailed police livery also has a flashing blue light. Inexhaustible determination lets his quarry know there’s almost no chance to escape. Four new cars are coming soon from Fly, including two factory BMW 3.5 CSL cars and an Audi Quattro A2 that have not been produced in nearly a decade, but with new deco. And there's a limited production hand-made replica of a 1976 Brabham BT44. All four are priced lower to reflect changes in the euro and dollar exchange rate. 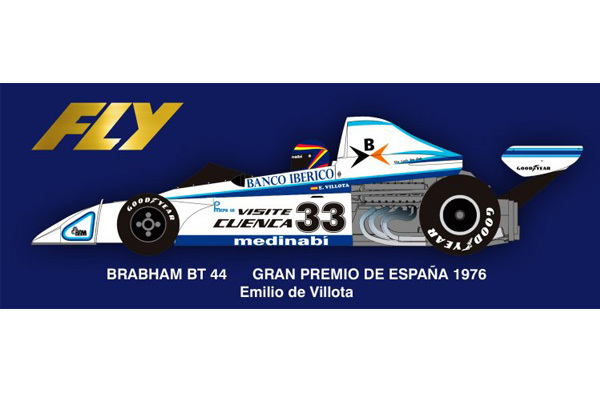 Fly A2000 Brabham BT44 Spanish GP 1976, Driver Emilio De Villota Hand-Made---PRE-ORDER NOW! 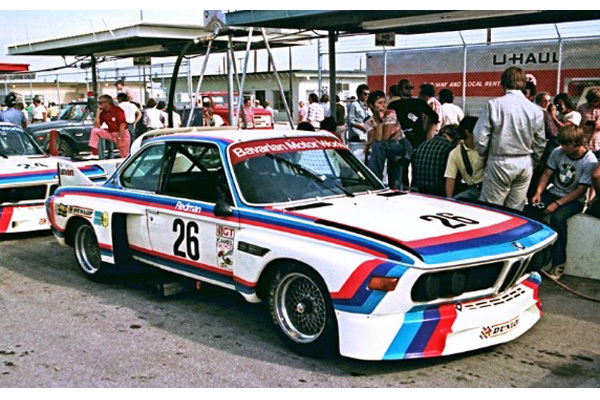 Fly A2001 BMW 3.5 CSL IMSA 1975, Driver Sam Posey---PRE-ORDER NOW! 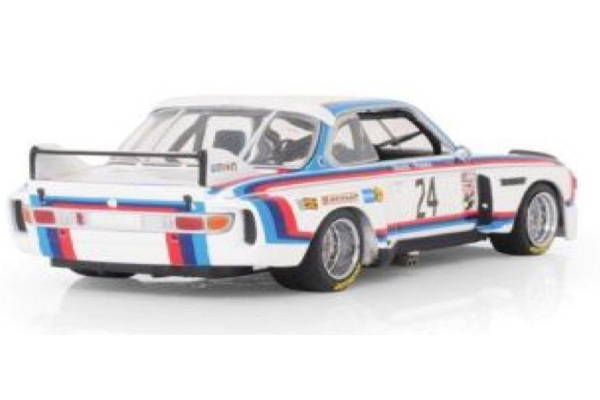 Fly A2002 BMW 3.5 CSL IMSA 1975, Driver Brian Redman---PRE-ORDER NOW! 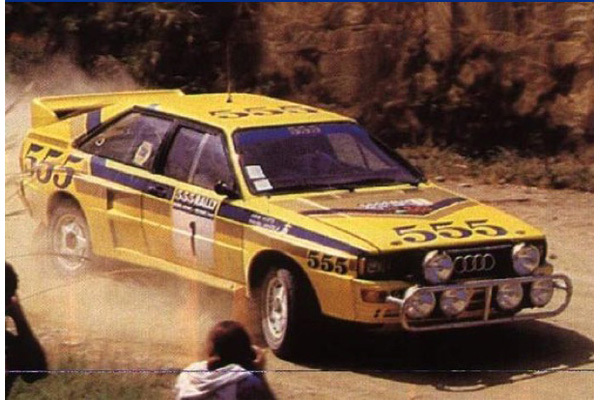 Fly A2003 Audi Quattro A2, Rallye Hong Kong-Beijing 1985, Drivers Hannu Mikkola And Arnie He---PRE-ORDER NOW!